Established in 1996 The Fitting Place specializes in the proper fitting of children’s shoes. Because of our extensive inventory of sizes and widths, we are able to provide the best possible fit for your child. A complete examination of the critical areas of fit-heel counter, instep, arch, ball, and toe, is mandatory. The final test is a walking/running exercise to see how the shoe conforms to the child’s walking pattern. The Fitting Place Staff operates under the principle that the shoe should fit the foot and not trying to fit a child into a particular style or brand. The store dynamics are arranged to provide your child with a safe, fun and relaxing atmosphere so that we can take our time making sure your child gets the proper fit. A large enclosed play area is strategically situated so your child can relax and become acclimated to our store. We do not hurry the fitting process. We believe in allowing the child sufficient time to experience the shoe. Then we can observe how the shoe is responding to a child’s gait and motion. A young child’s foot is still evolving until he/she is in their teens so getting the proper fit is essential to developing into a healthy adult. A child’s first steps usually occurs between 9-13 months and is a source of wonder, happiness and anxiety to all parents. Our store is designed to enlighten and guide you through the challenging process of getting the proper shoe that will complement your child’s development. We embrace the concept that there are four primary stages of infant walking. For each of these stages, we carry the proper shoe to encourage, develop and stabilize your child. 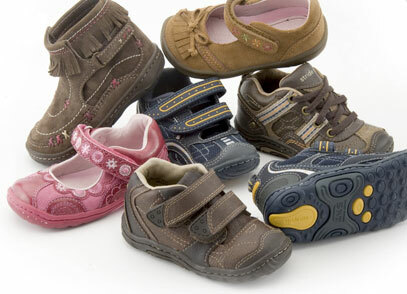 As we fit your child, we explain how the child is guided by a particular shoe. During the growth years 1-10, your child should be checked frequently for wear pattern and comfort level. Children grow rapidly and gladly assist parents by examining current shoes for signs of tightness, uneven wear, and sufficient relaxation in the foot. All the essential fitting criteria (length, width, heel, toe box, instep, arch) are observed. At this juncture we are able to recommend the next type or size of footwear. In our examination, we are interested in ascertaining how the foot is developing and making sure the shoe is matching the right stage of foot development. The following stages gives you an overview of what we are looking for and how we go about choosing the proper footwear. STAGE 5- 12-18 YEARS Foot has formally developed . If your child has been properly fit, Adulthood should be problem free vis-à-vis the foot structure. Our goal is to guide you through these stages and to make sure your child has an excellent foundation for the rest of Their lives with our extensive width structure and inventory we feel confident that we can assist you. And NEVER use “hand me down” shoes each child has a distinct walking pattern and your child could easily develop Deformities since their feet are so malleable and pliable. Please stop by at your earliest convenience we welcome the opportunity to serve you and explain /guide you through the myriad of different foot types. Our mission statement is to fit your child properly.